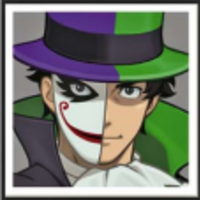 Welcome to my fandub for Phoenix Wright SOJ! If you audition, be sure to join the discord! Voice acting will begin when there are enough people cast for a chapter. Keep in mind it will take a bit to get each episode out so the later the chapter the character is in, so if you one, keep that in mind. It will take a while to get auditions for every character so give it a bit of time. You can be very improv with how the voices are. I don't want to limit anything voice wise so as long as it sounds generally like how they would, it's fine, however. If there is a specific character you'd like to audition that isn't out yet, tell me and I'll work on them. 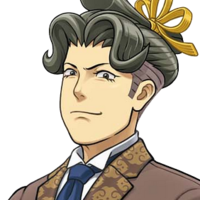 The Lead attorney of The Wright anything agency, a very experienced attorney who takes a vacation to Khurai’in to visit his old friend, Maya fey. He's now about 35, remember when he was like, 20? 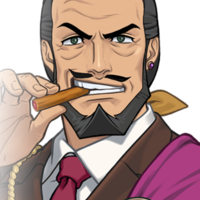 "My name is Phoenix Wright, and I run a small law office. Well, that's what I do back at home anyway. Right now I'm just a traveler; a stranger in a strange land." An attorney at Wright anything agency. Hes worked under Phoenix for about 2 years. As he finds out about his family he tried to put behind, he’ll find out he should never have. He uses his bracelet to sense small, nervous fidgets in other people. 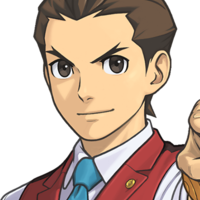 "My name is Apollo Justice. I'm a rookie lawyer with only about two years of experience under my belt." An energetic newbie to the Wright Anything Agency. Has only worked for about a year and is a young attorney at the age of 19. She helps Apollo in many cases. She uses her analytical psychology in the courtroom to identify when a witness is behaving strangely emotionally with her Mood Matrix. My name is Athena Cykes. Armed with analytical psychology, and a full arsenal of legal know how... I'm a fully-competent defender of the Wright Anything Agency!" Athena's little robot buddy. He says what Athena thinks and even changes color depending on how she feels. 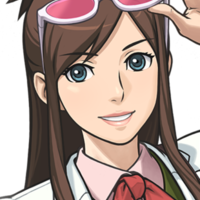 He helps Athena by projecting a hologram that she uses for notes, research and general case things. It is also how she uses the Mood Matrix to tell witnesses emotions. The master of the Kurain channeling technique, at Kura'in. A close friend to Phoenix. She is very close to finishing her training, and Phoenix has come to visit her. He comes at a rough time, however, as she is accused of killing to people a bit after they meet again. "Hee hee! Long time no see, Nick! Well? Well? Did I surprise you with my act?!" "It wasnt me... But no one will believe me. Nngh..."
One of Phoenix's close friends and Maya's cousin. She is a spirit channeler who is part of the Fey branch family. Apollo meets her while visiting Fey village with Dhurke. 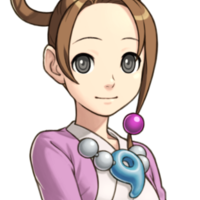 She is a high school student who often visits Phoenix and Trucy. "It's been quite some time, How have you been?" "Well, I... I wouldn't mind a new outfit or two, and, well... um... Oh, never mind." Phoenix’s tour guide who is training to be a monk. Once he starts talking about something he likes, there's no stopping him. 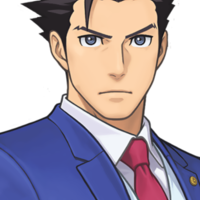 In The Foreign Turnabout Phoenix defends him in court on charges of murder. "Excuse me, sir! Pardon me but are you, Mr. Wright?" 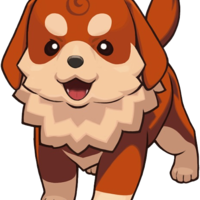 Ahlbi's Pet pupper. He sits on top of his head. An international prosecutor and monk from Khura'in who performs last rights for victims in court. Apollo soon finds out that he knows Nahyuta, that he's his brother, and is indeed a Defiant Dragon. 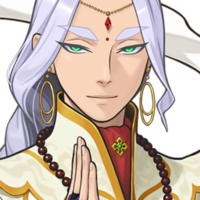 he serves under Garan and hates defense attorneys and often hurts Phoenix Athena and Apollo by squeezing them with his beads. "A thousand pardons. it was rude of me to keep you waiting." There is no merit to be had in indulging the ramblings born of a criminal's unclean soul." "I knew all lawyers were crimanals! I must now redouble my vigilance!" "Hello. I'm Ema Skye, forensic investigator." "Fingerprinting, luminal testing, DNA analysis -- Ema Skye is raring to go, so bring it on!" "I just want to state for the record that... 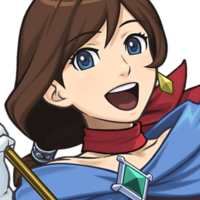 I believe Trucy Wright is innocent!" 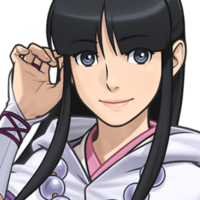 "A lot of people get this wrong but... Apollo's actual job is being my magic assistant!" 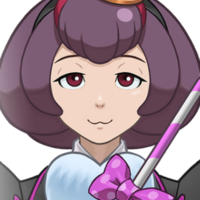 "Prepare yourselves for an exclusive explanation by Magical Girl Trucy Wright!" 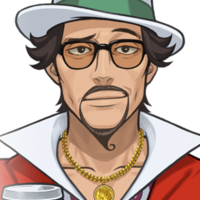 Apollo and Nahyuta's father. After a fire, and Dhurke being accused of it, he went into hiding. He adopted Apollo afterward, he rescued Amara, who also went into hiding. They eventually gave birth to Rayfa. When he returns to Apollo to have one final reunion. "Sounds like the winds of change are beginning to stir." "Hey there, Apollo! Long time no see! How've you been son?" "I'm placing my fate in your hands." Dhurkes right-hand man in the rebel group, defiant dragons. He has recently been caught, but while trying to escape, gets amnesia and forgets his name. Very carefree and friendly likes to give others nicknames. For instance, with phoenix. He nicknamed him PW. "Looks like they've got me again! Three times in one year! "Datz" a new record! Har har har har har har!" "A lady whose husband's been imprisoned, parents whose son's been falsely charged... She's helping all those types of people." 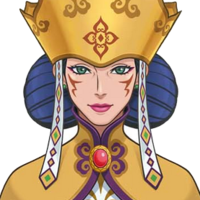 the queen of the Kingdom of Khura'in and a former prosecutor. After envying her sister, having no spiritual powers herself, she planned out a fire to run her out. Amara steps in when she has to perform actual spirit channeling. "Ho ho... May the Holy Mother's blessing be upon you." 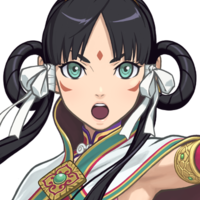 "May we presume you are here for Maya Fey, the spirit medium who has been abducted?" "I can't... That's not possible...!" 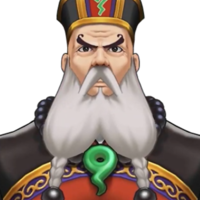 A more stern, but still doofy, old judge. He has different attire and a different beard! "It certainly does sound worth seeing! And it'd give me a juicy tidbit to tell the missus. 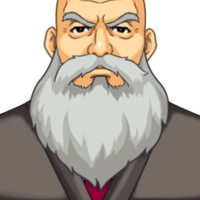 The judge where Apollo and Athena do their court cases. No one really knows how old he is. prosecutor prodigy and current Chief Prosecutor. He has been friends wit hPhoenix since grade school and his rival. 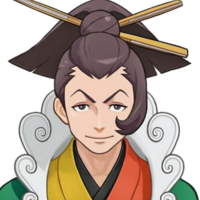 He helps everyone out by getting them to Kura'in in Turnabout Revolution. 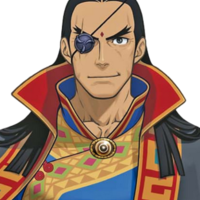 He also prosecutes the trial in Turnabout Time Traveler. "And I will do what's necessary to hide the fact that Dhurke Sadmadhi is onboard." "I'll contact the royal family and the local police, and inform them of our arrival." "As I understand it, he has been officially charged with the murder of Minister Inga." 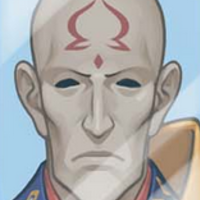 The head monk of Tehm'pul Temple, and a witness of Ahlbi’s trial. He plays an instrument called a Dahmalan. Has a very relaxed composure until Phoenix starts pressing him and reveals him as the real killer. A prosecutor who calls himself the Rookie Humiliator. He wears a crown, sash and yellow outfit, and gloats about how ‘great’ he is. since there were no attorneys to stop him, he has risen to the top of the prosecution ranks. He is very snarky and has an ego the size of Khurai’in. "Heh he heh. Call it nostalgia, if you will, but I am most eager to give it a try." 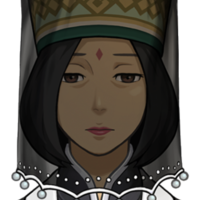 The Minister of Justice for the Kingdom of Khura'in, as well as husband to Queen Ga'ran. 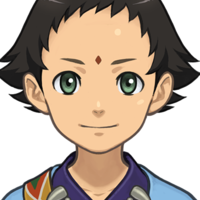 "I'm the Khura'inese Minister of Justice. The name's Inga Karkhuul Khura'in." 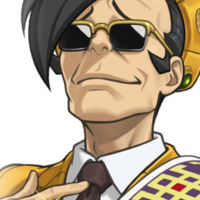 "Heh, you lawyers are all the same. You strut your stuff till the DC Act comes down hard. Then you start begging and pleading for your lives. It's really hard to watch, I tell you." A magician knew well for her teleportation trick that actually happens with her twin sister that keeps hidden until Apollo reveals her in court. 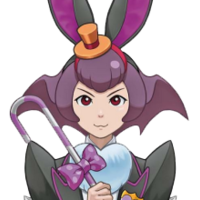 A big fan of trucy's that uses bunnies as her theme. She's clumsy and puts herself below Trucy. She is pushed around by her sister constantly, an example is being pulled into the prank pulled on Trucy. "Performing magic is like walking a tightrope -- there's always an element of danger." "I can't help it. Whenever anybody asks, I can't bring myself to refuse...."
"Really? 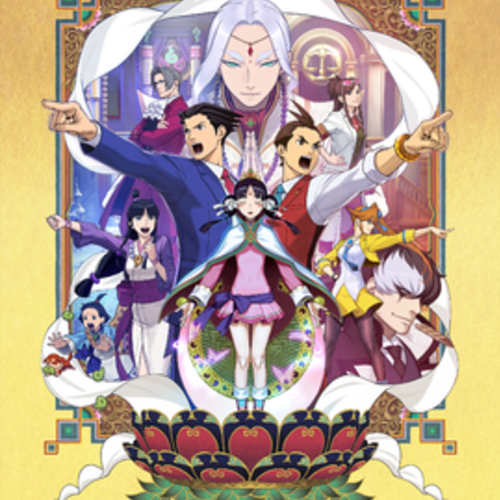 But if we hadn't seen Trucy's magic show... We never would've tried to become professional magicians ourselves, right?" Bonny's twin sister who has been kept hidden until Apollo reveals her. She loathes Trucy unlike her sister and agreed to pull a joke on her during the show. Also unlike her sister, she is very rude and her main theme is bats instead of bunnies. "If you mess this up, you're gonna really be sorry. You hear me? I'll crush you flat. Like a cockroach under my foot!" "Nope! There's only one Bonny. That's because... I'm Betty!" "Ever since our debut, I've had to hide or pretend I'm Bonny. All cute and sweet and goody-goody...."
The person standing in as Mr. Reus for the real Mr. Reus. Doesn't play a major role in the game. "Greetings viewers! It is I, The Great Mr. Reus!" "...preparing to play a prank on Trucy!" A producer who was previously a famous magician of Gramarye. he thinks high of himself. Once he found someone fond of his work, he let him take over. 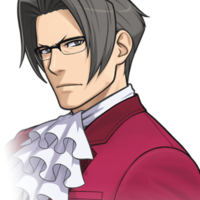 Once Apollo reveals his true identity in court, he starts losing it. "What the heck's going on?! They wouldn't even let ME in. ME, for crying out loud!" "Say something funny for the people at home! Go on, hit me with your best shot!" "No tricks, no gimmicks. True magic doesn't need trap doors to escape through!" 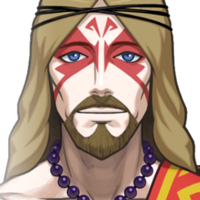 A high priest of Kura'in who was found dead after the purification right with Maya. He is later channeled by Maya and asked to testify. He is also secretly a member of the Defiant Dragons. "Would this be the Twilight Realm? And what of this luxurious mane of hair...? Is it perhaps a gift from the Holy Mother, for decades of faithful service?!" "All who serve Her Holiness must strive to banish worldly desires from their soul! Open your heart! Let the Holy Mother in! Purge your mind of greed and bias!" "Forgive me, your Benevolence. But it was the only way to help my lovely wife." Tahrust's wife. After finding out her husband was the killer, and having to send him to the twilight realm, she joined the Defiant Dragons. "Look dear, the royal priestess has come to visit us. Yes... Mm-hm. ...What's that? ...Oh, of course... hee hee." "It arrived about three days before the Purification Rite." "Darling... I'm so glad I was able to see you one last time." 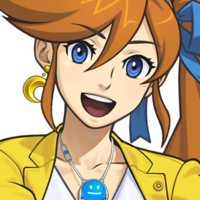 A prosecutor, and good friend of Athena's. After being previously freed by Phoenix Athena and Apollo, he asks Athena to defend his friend. He testifies before joining Athena's side as her co-counsel. He uses psychological manipulation and other types of psychological ways to manipulate witnesses. "You needn't get so worked up, Athena. His Baldness can wait." "Motive, opportunity, and an injury to his forehead -- Is that all it takes to make you stop believing in your client!? Tell me again, who are you to Bucky?!" Head soba chef of Whet Noodle. Calls Athena Miz Chickadee and Simon Simey. He drinks in mourning for his father and has drank so much he gets nausea and blacks out. "Hrrnhhh...? Who's dis yeller chickadee?" Lemme resht? Hah! Mehbee if I were a lump o' regular flour dough fer udon noodles! But I'm fresh, like my soba! 'N y'don't let soba dough resht... 'S all about the three freshes! "Thanks, Simey! And you too, Miz Chikadee!" A rakugo performer who was a witness in the murder of his rakugo master. He has dissociative identity disorder or Multiple Personality Disorder. 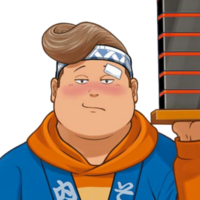 He has a total of four Uendo, the rakugo performer, Patches, the jester, Kisegawa, the female courtesan, and Owen, the child. "I am the rakugo storyteller Uendo Toniedo." "Hello, everybody! Patches, the friendly jester here! Hee hee! Hmph. Kisegawa. Courtesan." 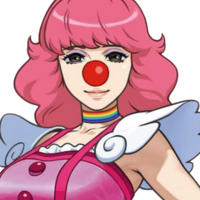 A balloon artist who hates her job and wants to be a performer like her father. She was so mad at her father for making Uendo the master that in blind rage, she killed her father. "Just call me Geiru, sweetie! One, two... BLOOOON!" "Grrrrragh! Will ya EVER quit yer yappin'!?" "Why are my balloons burstin'...? Daddy... are ya made at me...?" A politician running for local assemblyman of Kurain Village. Thinks very highly of himself. 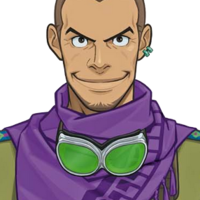 He was a part of Inga's plans to kidnap Maya and get the founders orb. 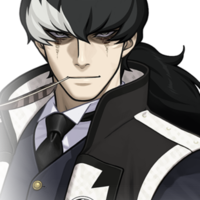 He blackmailed Phoenix to defend him for murder in a civil trial. "After all, I am the man who's destined to be the king of this fine nation someday." "A vote for Paul Atishon is a vote for a happier. 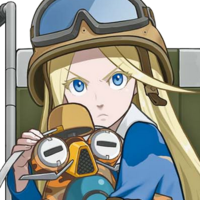 hopey-er Kurain Village!" "My political career...! It can't end like this!" Archie Buff's daughter. She is obsessed with the military and has her own drone with a voice modulator. She uses it to communicate since she is bound to a wheelchair. She also uses it because of her mom dying and becoming a shut-in as a result. "S-Sergeant Buff, r-reporting for duty." "Careful, soldier! Don't forget I could blow you away at a moment's notice!" "I want to see what Papa was searching for with my own eyes!" 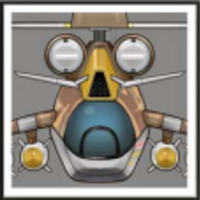 A drone controlled by Armie Buff. Has the voice of an army sergeant and requires everyone call them that. Armie calls using the drone her "siege defense". "Youuuu maggots! Whattaya think yer doin', invading Buff airspace?!" "Drone, nothin'! That's Sergeant Buff to you, soldier!" "...if I hadn't engaged in my siege defense, Papa would still be alive."